As 2016 began, the fun and excitement of the annual Tournament of Roses Parade and Rose Bowl Game reminded me once again of how uniquely special the City of Pasadena is to the world—we are America’s New Year’s Day Celebration. Our community, our public service and our hospitality are world-renowned, and it is our reputation which inspires us to ensure the municipal programs and services we provide throughout the year to our citizens and businesses are equally as impressive. This Annual Report provides a brief summary of many—but not all—of our accomplishments in 2015, and is a snapshot that highlights key data. A change in this year’s Annual Report, however, is a greater focus on performance measurements to better communicate our collective priorities and progress. Although we have accomplished much in 2015, there is always more work to be done and we will constantly look for ways to raise the bar of excellence. During the past year, a core emphasis in all departments has been for City staff to strengthen our financial administration and internal controls to ensure that crimes such as the embezzlement from the Underground Utility Program can be prevented or detected early. One of the most significant changes was implementing a new citywide financial system that culminated three years of extensive work across all City departments. We welcomed two new City Council members in 2015 as well as five new Department Directors to the City’s Executive Leadership Team. In 2016, we will add more new people to our executive team as the City Council selects a new City Manager who, in turn, will fill two remaining Department Director vacancies. I have the utmost confidence that your new City Manager and Department Directors will continue our long history of excellence in Pasadena by working together with Mayor Terry Tornek, the City Council, staff and our community. Our organization faced many challenges in 2015, but thanks to the strong leadership of the City Council and the dedication and talent of our employees, the year was also filled with many accomplishments. I am very grateful for their exemplary work and it has been one of the greatest honors of my life to serve with them during more than seven years as Pasadena’s City Manager. 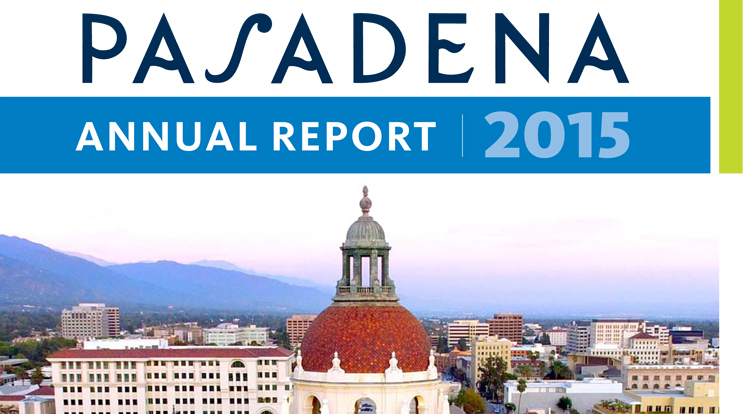 In that spirit, I submit to the Mayor, the City Council, our employees, residents and businesses the Pasadena Annual Report for 2015.